Battle of Adrianople (378) - The cracks in the Roman Empire began breaking from a defensive standpoint at the Battle of Adrianople in 378 A.D.. Sometimes referred to as the Battle of Hadrianopolis (because it was fought near the city named for Emperor Hadrian), it was the first major conflict between Romans and the invading barbarians from North and Central Europe known as the Goths. However, it did not begin as a military invasion, and was not even instigated by the Goths themselves. The real culprits were the Huns who had migrated from central Asia in the preceding years (see Attila the Hun), and came to occupy Gothic lands across North and Central Europe. The Hunnic armies were overwhelming, and the Goths fled south, crossing the Danube River, and entering Roman territory in 376. Their leader was a man named Fritigern, and their tribe was called the Thervingi. Initially, they appealed to Rome (or in this case Constantinople as it was now the capital) for asylum from the Huns. Emperor Valens not only granted asylum, he promised them land on which they could live and farm, and offered protection from the Huns. He even promised them food until they could get settled and start growing it on their own. Valens saw the Goths as a potential resource with which to bolster his army and expand his tax base. But as it happens all too often, things didn't go as planned. There was a far greater influx of immigrants than the emperor anticipated or the empire was prepared to handle. And Valens apparently was expecting them to trickle across the border; but instead they arrived in waves. There also must have been poor communication between Constantinople and the local authorities. The locals had neither the land nor resources to accommodate the new arrivals. Instead of granting them land on which to farm, they were herded into holding camps under the watch of armed guards. At first the Goths tried to make the best of the situation. However, when the government sent the food that Valens had promised, there was only enough to feed the soldiers who were guarding the camps. And as they were in charge, they ate first. The Goths began to starve. So they appealed to the local administrators for assistance. But the response was rather bleak. In exchange for turning some of their younger members over to become slaves, they would be provided with animal feed. Fritigern warned Valens to send assistance at once or the situation would deteriorate rapidly. 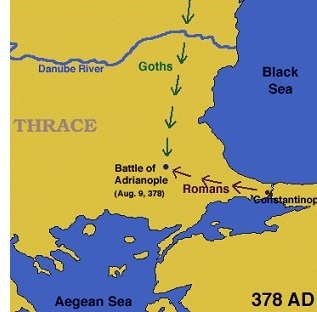 In order to try to alleviate the coming crisis, Valens ordered the Goths be released from the camps and sent to find food and other provisions at the city of Marcianople, some 30 miles (48km) away. But, when they arrived at Marcianople, the gates were barred and they were ordered to leave. For the Goths, this was the final straw. They began to riot. It should be noted that when they first entered Roman territory, they were ordered to give up their swords. However, most of the Goths were able to bribe the officials into allowing them to remain armed. As a result, they were now loose in the countryside and had weapons. To make matters worse, Goths were still crossing the Danube, adding to their numbers. They pillaged the land for almost two years before the Romans were able to respond militarily. Valens asked Gratian, the western emperor, for help. Gratian dispatched an army. Fritigern knew an attack was coming, and likewise, organized his men into a fighting force. His infantry took a circular defensive posture, while his cavalry was off raiding several miles away. The two sides met at Adrianople. Valens led the Roman army himself. When he marched within sight of the Gothic army, Emperor Gratian and his forces had not yet arrived. Our only account of this battle and the events leading up to it come from a Roman historian named Ammainus Marcellinus, who was also a soldier serving in Valens' army. He records that Valens decided not to wait for Gratian, but does not explain the reason. It has been speculated that Valens decided to attack either knowing that Fritigern was without his cavalry, or because he wanted the glory for himself. Or perhaps both. Marcellinus does not provide the size of the armies, so any number given is simply a guess. 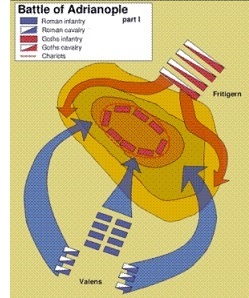 What is provided is that Valens attacked and Fritigern's forces held their ground. 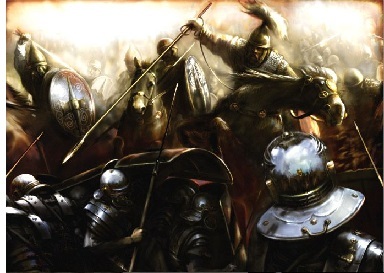 The Romans appeared to have a slight advantage, when the Gothic cavalry arrived and turned the tide. It surrounded the the Roman army, while the Gothic infantry became emboldened and broke out of their defensive formation. A tough battle turned into a route for the Goths, while Valens and several of his top officers were struck down. It ranks as the worst defeat by a Roman army since Teutoburg Forest. In the aftermath, the loss was a severe blow to the empire, both psychologically and in real terms. Psychologically because the barbarians were now at the Romans' doorstep and could not be dislodged. And in real terms, they continued to loot unchecked for some time until Valens' successor Theodosius I made peace with them. The empire was now too weak to boot them out, so Theodosius tried to "Romanize" them as best he could. Even though Adrianople was fought in the Eastern Empire, it generally is viewed as the conflict that initiated the eventual collapse of the Western Empire. Remember that Constantinople was an almost impenetrable city (see Constantinople), while Rome and the west lay wide open to attack from the barbarian horde.